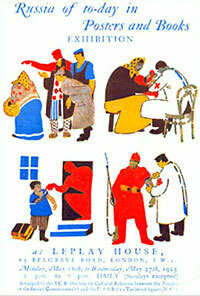 The SCRSS Soviet Collections are a library and archive of the arts, humanities and social sciences of the Soviet Union (1917-91). They provide a treasure trove of books, periodicals, photographs, music scores, audio recordings, and other artefacts in Russian and English. The collections were established in 1924 and are unique in the UK, charting the history, language and culture of the Soviet Union from 1917-91 through predominantly Soviet-produced materials. They include rare materials from the 1920s-40s, the Society's archive records and a number of personal collections. The collections are of interest to students, academics, historians and professional researchers with an interest in Russia and the other republics of the former Soviet Union. Key subject areas are art and architecture, literature, music and dance, social and political history, theatre and cinema, and the SCRSS Archive. The SCRSS Soviet Collections include the Research Collections, General Reference and Loan Collections. These collections are complemented by our Photo Library. The Research Collections include the Society's most important and rare collections, including art and architecture, music, theatre, cinema, children's literature and the SCRSS Archive. They are partially listed: listing and digitisation are ongoing. The General Reference Collection includes Russian language dictionaries, encyclopaedias, atlases, maps and periodicals. The majority of the Society's books must be consulted in the building and cannot be borrowed. However, the Society maintains a Loan Collection that includes a range of fiction and non-fiction - from Russian and Soviet literary classics to biography and history. Most publications are in Russian but the literature collection includes English translations and there are a number of English-language titles on key subjects and periods in the non-fiction section. In the Loan Collection, members may borrow six books at one time for a period of one month. Postal loans are available with members paying for postage and packing. SCRSS personnel reserve the right not to lend books where there is any concern about their physical condition or other issues. The Library Collections (research collections, general reference and loan collections) are available for use by current SCRSS members. Please note: this excludes the SCRSS Archive. See our Membership page for details of how to join. With the exception of visits made during the Society’s monthly Saturday openings (advertised on our Events page), the Library Collections are accessible strictly by appointment only. 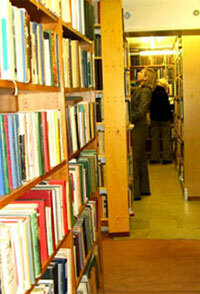 Please always contact the Society in advance and by email to discuss visiting the Library Collections.